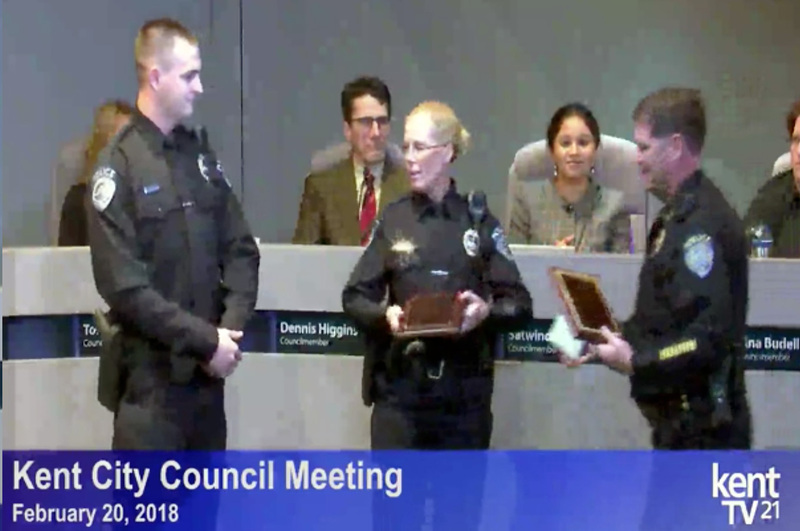 The City Council also heard at Tuesday night’s (Feb. 20) meeting citations for two police officers administering a drug to save a life, and Mayor Dana Ralph swore in two new city police officers. Kurt Hanson, the Kent deputy director of the city’s Economic and Community Development Department, told Council of the history relating to the northeast corner of Highway 167 and Kent-Des Moines Road. Over a decade from 2006 to 2016, the city assembled the property at the interchange but he said the city has now “moved away from that plan.” The property was considered surplus in 2016, and in 2017 the city sought interest in a developer for “hospitality use” for the property. Council approved Hanson’s request for permission to hire a broker to find potential buyers for the property. 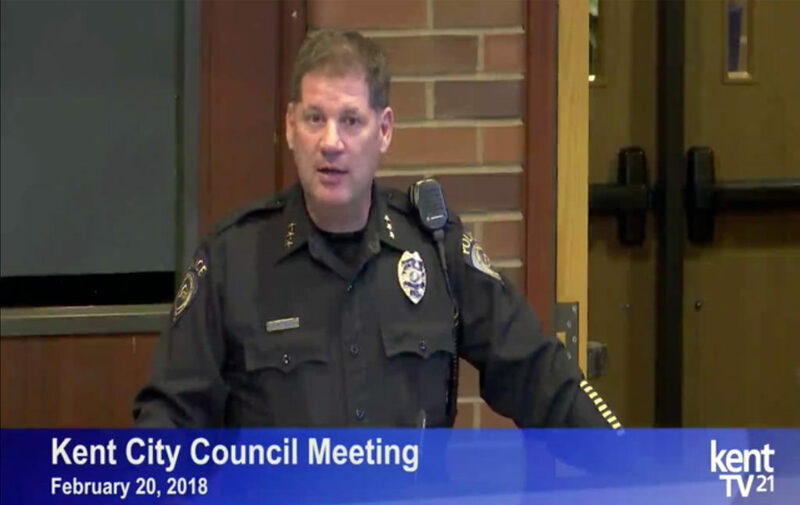 Chief of Police Ken Thomas gave the Council an update on the East Hill shooting at 108th and 240th but said “we are not getting a lot of cooperation from victims and witnesses at a community meeting” held on Sunday, Feb. 18. More meetings are planned and the investigation of the incident continues. As we previously reported, on Jan. 31 near 10 p.m., Kent Police responded to a report of two people being shot and another person being struck by a vehicle on Kent’s East Hill. A 19-year old male who was shot was pronounced dead at the scene. 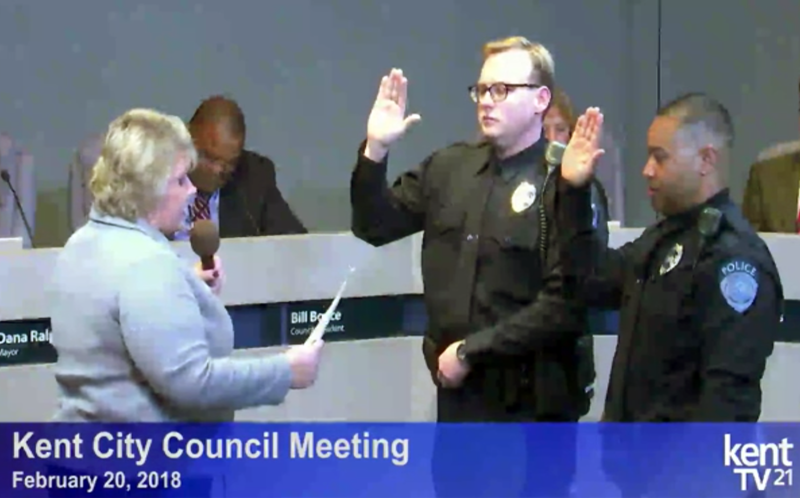 Two new officers, Louis Daniels and Joshua Hartman, were sworn in by Mayor Dana Ralph at the Council meeting. Chief Thomas gave the citizen commendation award to Patrick Helmbrecht and Harli Thompson who assisted officers stop and arrest a person trying to evade arrest on the Kent-Des Moines Road. Also two Kent officers – Lisa Hartley and Sean Goforth (pictured above) – were given a lifesaving award for injecting the anti-drug Narcan into a person suffering an overdose. The chief said medical personnel said the person would have died without the quick work of the two police officers.